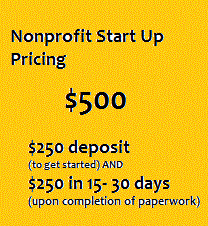 JS Crockett Consulting takes the overwhelm out of the nonprofit start up process. We help you through each step quickly, so that you can focus on developing your mission based activities. We offer nonprofit consulting and coaching as part of your process with us. Sign up today and find out how easy we truly make this happen for you. See what our customers have to say. A JSCC Consultant will contact you within 24 business hours after we receive payment of the deposit of $250.00. Click here to contact us or schedule an appointment to learn more. To learn more about us, click here. I understand that JS Crockett Consulting and associated consultants will work to fulfill its goal to assist with completing the paperwork for nonprofit tax exemption and further understand that all determination of tax exempt status must be provided solely by State and Federal Agencies. This form processes the initial payment of $250.00. Upon receipt of the deposit, JS Crockett Consulting will contact you [our new client] within 24 business hours to begin work towards your organization's nonprofit status. Final payment of $250.00 is due after all of the forms have been completed within 15-30 days. This payment will be requested via JSCC invoice. Thank You for Your Business. If you have any questions, please don't hesitate to contact us at (657)201-9895. Start Today, Pay Later (no interest for 6 months)! To purchase the downloadable templates for this series, go to the downloads tab. Follow the FREE video series on YouTube to the right (or click here to see all of the videos in this series).